The population profile of the provinces and territories could become increasingly different in the decades ahead, because of changing demographic trends. A new article released today, titled "Recent changes in demographic trends in Canada," provides an analysis of these demographic trends at both the national and provincial–territorial levels. From 2011 to 2014, Canada's population growth averaged 1.1% a year. However, this national average masks some major differences among the provinces and territories. For example, Manitoba, Saskatchewan and Alberta had the strongest average population growth of all provinces during this period, for the first time since 1971. While Alberta has had the strongest population growth in nearly all years since 1997, the recent growth in Saskatchewan stands in sharp contrast to the period from 1997 to 2005, when the province was losing population. From 2011 to 2014, Ontario had growth rates that were slightly below the national average. This is a change from the period from 1982 to 2005, when Ontario consistently had a higher growth rate than the national average. Population growth also slowed in British Columbia in recent years compared with the 1990s. 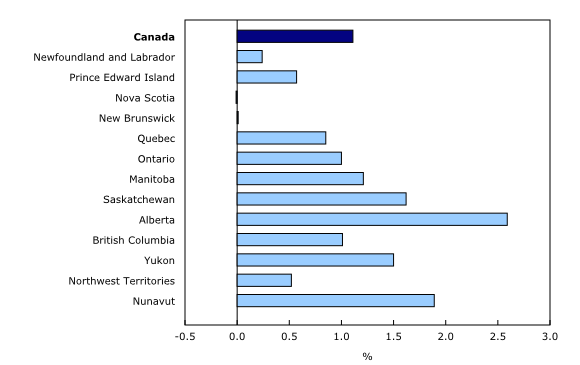 In Quebec, the population growth rate averaged 0.8%, below the national average. Recently, however, the growth rate in Quebec moved closer to the national rate and to Ontario's rate compared with previous decades. Population growth in the Atlantic region remained below that in other parts of the country, as the Atlantic provinces, with the exception of Prince Edward Island, posted near-zero growth on average from 2011 to 2014. In recent years, about two-thirds of Canada's population growth was due to international migratory increase, which can be defined as net population gains from other countries. The other third was due to natural increase, which corresponds to an increase in the number of births minus the number of deaths. 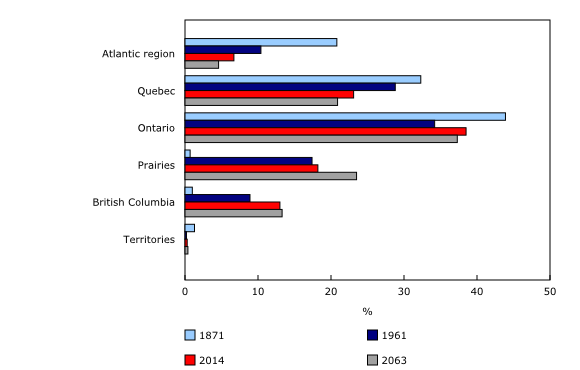 In three of the four Atlantic provinces, natural increase no longer contributes to population growth. In 2014, more deaths than births were recorded in New Brunswick, Nova Scotia, and Newfoundland and Labrador—the consequence of a rapidly aging population. In all other provinces and territories, natural increase contributed to population growth, albeit in varying degrees. In Nunavut and the Northwest Territories, nearly all the growth was due to natural increase, a consequence of the higher fertility rate among Inuit and First Nation peoples. Over the next two decades, the contribution of natural increase is expected to decrease in all provinces and to remain negative in the Atlantic provinces. This suggests that these provinces would have to attract more migrants for their populations to grow in the future. The Prairie provinces (particularly Manitoba and Saskatchewan) recently attracted proportionally more international immigrants than in the past. As a result, international migratory increases now represent the main source of population growth in these provinces. If the current trends continue, the provinces could become increasingly different in terms of the age structure, ethnic diversity and population share. In 2014, for example, the proportion of people aged 65 and older at the national level was 16%. However, on a provincial basis, this proportion ranged between 11% in Alberta and more than 18% in Nova Scotia and New Brunswick, a seven-percentage point difference. By 2034, that same proportion could range between 18% in Alberta and 31% in Newfoundland and Labrador, a difference of 13 percentage points. Similarly, in 2011, 19% of Canadians belonged to a visible minority, but that proportion ranged between 1% in Newfoundland and Labrador and 27% in British Columbia, a difference of 26 percentage points. That difference could widen to 37 percentage points by the early 2030s, reaching a low of 3% in Newfoundland and Labrador and Prince Edward Island and a high of 40% in Ontario. In 1871, 44% of the population lived in Ontario, 32% in Quebec, 21% in the Atlantic provinces, and 3% in the West (British Columbia, Manitoba and the then-Northwest Territories, which included the future provinces of Alberta and Saskatchewan as well as Yukon and Nunavut). By 2008, the population share in the provinces west of Ontario (31%) had surpassed that of the provinces east of Ontario (30%) for the first time. The population share of Ontario was 39%. According to Statistics Canada's most recent population projections (and if recent demographic trends continue), the population share of the Prairie provinces could surpass Quebec's in less than 50 years, and the population share of the four Atlantic provinces could decrease to less than 5% of Canada's population. The results of this study are also described in the video A Statistics Canada Minute – Regional Demography. This release presents data from the Demographic Estimates Program, the Population Projections Program (including the microsimulation model Demosim), the censuses of population and the 2011 National Household Survey. Natural increase is the difference between the number of births and deaths, and determines whether a population grows or declines in the absence of migration. International migratory increase is the difference between the number of immigrants and emigrants and also includes net non-permanent residents. Interprovincial migratory increase is the difference between the number of in-migrants and out-migrants in each province or territory. It is the balance of internal migration exchanges among provinces and territories. The article "Recent changes in demographic trends in Canada," which is part of Insights on Canadian Society (Catalogue number75-006-X), is now available from the Browse by key resource module of our website under Publications.